On November 23, 2016, an official meeting of Rector of the NMU Prof. Kateryna Amosova and Head Physician and Director of the Psychiatric Clinic of Munsterlingen, Thurgau (Switzerland) Prof. Gerhard Dammann was held. 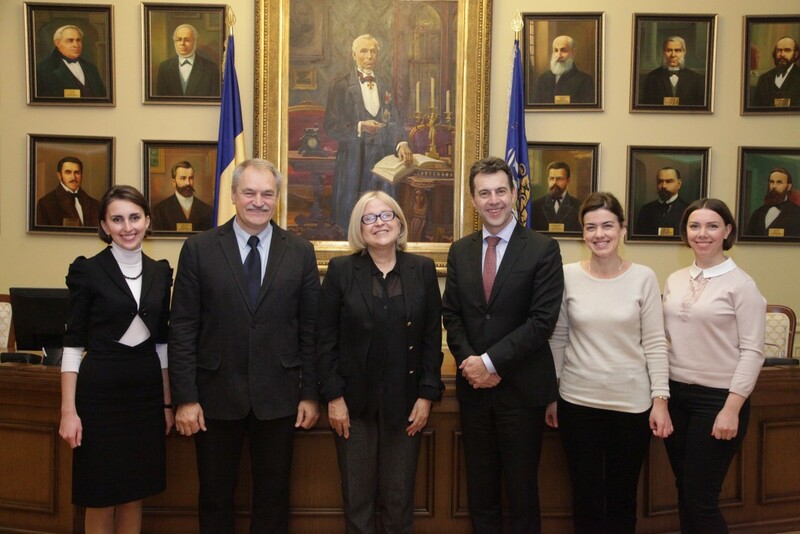 Vice-Rector for International Relations, Research and Education Prof. Olesia Lynovytska, Head of the Department of Psychosomatic Medicine and Psychotherapy Prof. Oleh Chaban and Head of the Department for International Cooperation Hanna Malunova also took part in the meeting. Within the meeting, the parties outlined the circle of common interests in the fields of education, science and clinical work. It was found out, that the activities and approaches to solving urgent problems of psychiatry of the Psychiatric Clinic of Munsterlingen and Prof. Dammann, in particular, coincide with the basic directions of activities of the Department of Psychosomatic Medicine and Psychotherapy of the NMU. The parties discussed the key milestones for future cooperation and signed a Memorandum of Understanding between the NMU and Psychiatric Clinic of Munsterlingen.